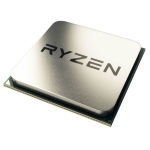 • AMD's high-performance x86 Core "Zen" architecture helps delivers over 52% improvement in instructions per clock cycle over the previous generation AMD core, without increasing power. • Cool and quiet processor operation using a grid of smart sensors that monitor CPU temperature, resource usage, and power draw. Adaptive control optimizes power draw for almost any workload with minimized power consumption that helps reduce system heat and noise. • Incredible virtual experiences require incredible computing power. Select AMD VR Ready processors unlock virtual worlds for you to enjoy, thanks to advanced AMD FX and AMD Ryzen processors that meet or exceed the requirements for either the Oculus Rift or HTC Vive premium head-mounted displays.